Miranda’s Hideaway, an open concept log cabin studio is a wonderful alternative to staying in hotels or even bed and breakfasts. Loft has a full size bed. Living area with queen bed, and pull out twin sofa. Guest House is appointed with flat screen TV, cable, DVD player, Wi-Fi. Kitchen is fully equipped. Two burner electric cooktop, convection oven, microwave, small refrigerator with tiny freezer. Coffee Maker. Small, cozy outdoor patio equipped with bench seating and cozy dining spot. Apartment sized gas grille for outdoor cooking. This cozy hideaway is perfect for vacation get-a-way when you are looking for relaxation. Just a short drive to famous Fryeburg Fairgrounds, Fryeburg Academy, Saco River, and so much more, you won't be disappointed. Foliage is beautiful in the fall months. 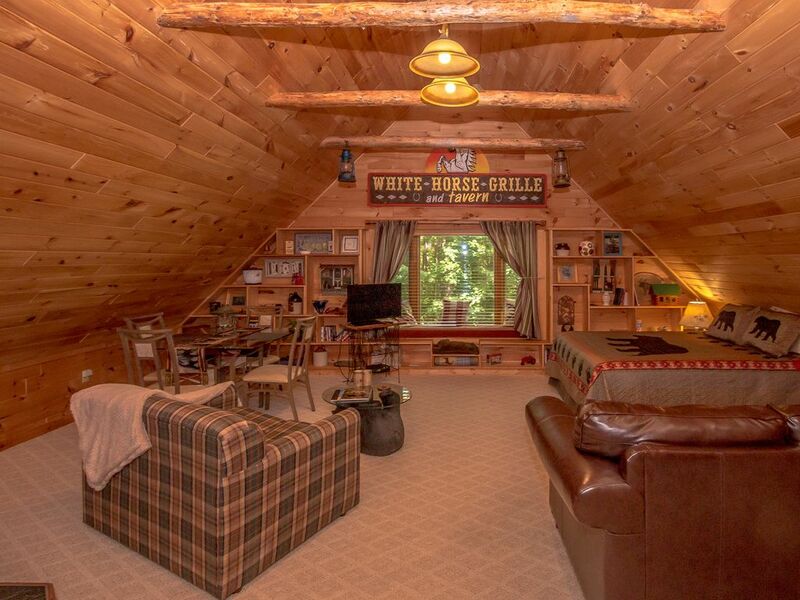 A private location but a stone's throw from Fryeburg Village activities. 10 minute drive to either ski mountain - Cranmore Ski Resort in North Conway, and Shawnee Peak Ski Resort in Bridgton, Maine. Lovingly built and designed by craftsman Rich Leavitt (owner), and interior designed by daughter Miranda--hence the name, Miranda's Hideaway. Two night minimum. We, as owners, created our family compound on Hidden Pines, which includes this Cabin in the Woods, along with Miranda's Hideaway and our log home. Rich is a builder and has built this property for a guest home for our family and friends. Now that our children are grown, we have extra bedrooms in our home for our friends, so we decided to have other guests, like you, enjoy all that we have to offer. We have lived in Fryeburg area since 1981 and have been blessed with the surroundings here of family and friends. Living on property, assures you that all your needs will be taken care of should there be a reason to contact us. We love where we live and always enjoy making new friends, yet afford you the privacy you desire. Lovingly built by Rich, Miranda's Hideaway was designed with family and guests in mind. Decorated by daughter, Miranda (hence the name), she thought carefully about living in a tiny space with all the amenities of a larger home. With a grown family, we decided to invite our guests to enjoy the peace and tranquility of a wooded setting, and yet, still a drive away away from downtown village of Fryeburg. Located between North Conway NH, a mecca for shopping, dining and many activities, and the same equal distance from the lakes region of Bridgton, Maine. Home of Fryeburg Fair, Saco River, Jockey Cap, Fryeburg Academy and Indian and Forest Acres Camps. You are so close to everything here yet, can look out your window in the early morning hours and catch a glimpse of beautiful deer, turkey, and on rare occasions, fox, and maybe a bear. Fryeburg, Maine location. Close to 4 season resort of North Conway, NH. Located in the quaint town of Fryeburg, Maine. Village setting. Free Wi-Fi - no password necessary! Stainless efficiency refrigerator and small freezer. covered patio with chairs, small table and bench. Outdoor lighting. Lan, Thank you for your kind words! It was so nice to meet both of you! I hope you got to enjoy going out on the snow machine trails! Please come back again...summer is beautiful here as well! Great place for two or a small family. Close to North Conway, skiing and sites. Building is new, well maintained, and immaculate. Everything you need to cook is there too (freezer IS small, as the owners mention). Thanks for an enjoyable stay! Peter, when I was a little girl I remember my mom always cleaning our home and she would say "cleanliness is next to Godliness". Your comment about cabin being immaculate brought that memory back. Esther will be thrilled to hear that. Please come again. We had a great time the cabin had everything we needed. The scenery was beautiful it was extremely clean and well maintained. We will definitely be back. This was a great space for my boyfriend and I to do a weeeknd getaway. It was a good location for a launch point for snowshoeing. The driveway was always plowed even with a big 16” snowstorm! Clean, warm, and adorable! The place was amazing! Very quiet, very clean. Had board games, a tv, and amazing views. Fryeburg is a wonderful little town. This cabin was comfortable and quiet. Brenda was very helpful and accommodating. The place was very clean and had everything you would need. Beautiful areas nearby including the White Mountains. We went tubing at Cranmore which was so much fun. Bad phone service there and in most of the area but we didn't use the phone much anyway. Would recommend to couples or families with children older than 6. Best known as the site of Maine’s largest fall agricultural fair, Fryeburg is also a great home base from which to explore the Saco River. You can rent canoeing or kayaking gear from a number of outfitters in town. You can also take a short hike up The Jockey Cap Trail near the center of town, which offers a 360-degree view of more than 30 distant peaks. Fryeburg also maintains 12 public parks, where you can go birdwatching, swimming, walking or fishing. Music concerts are hosted at different park locations throughout the summer. You can also visit a number of the town’s public spaces by taking a bike tour that begins west of Main Street at Weston’s Beach and continues over flat roads to nine parks. Stone Mountain Arts Center- A beautiful timber-frame hall hosting national acts year round, up close and personal, in the foothills of the White Mountains. International Musical Arts Institute- The International Musical Arts Institute of Fryeburg, Maine, is a summer chamber-music festival which draws upon the talents. Fryeburg Public Library-Located in an a circa-1832 stone schoolhouse. One room displays the research, correspondence, etc. of the author of Hopalong Cassidy stories. The museum is in the former Oxford County Registry of Deeds, a small Greek Revival-style building constructed in the 1820s. Fryeburg Fair Farm Museum - Located on the site of Maine's largest agricultural fair, the Farm Museum includes artifacts from many crafts and industries of early New England. Edge of Maine Frame & Gallery - Located on Main St in Brownfield Maine, the Gallery represents fine local artists and artisans and will be featuring new work every other month.